If you're short on time and short on green, this is the perfect way to satisfy the collective sweet tooth of a large family or a lot of dinner guests and look like Martha Stewart in the process; albeit a really ugly, butch, brunette version of her, but you get the idea. 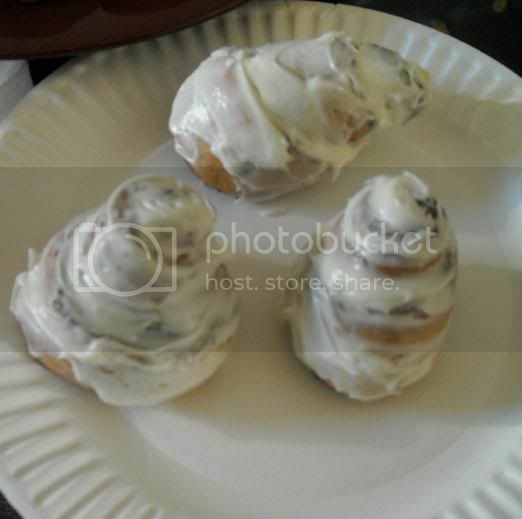 This isn't my best cinnamon bun recipe, meaning I do know how to make cinnamon buns from scratch, but I've yanked this particular trick out of my sleeve on occasion when I'm in need of a quick, cheap fix. You shouldn't be too proud to take shortcuts, they can be your lifeline when you're in "headless chicken" mode. Trust me, I've been there countless times. Beat together butter and vanilla for 30 seconds medium speed with an electric mixer. Add 2 cups of powdered sugar a bit at a time while beating. Then add 2 tablespoons milk. Slowly add in the rest of the powdered sugar and the rest of the milk until you get the right thickness for your frosting. 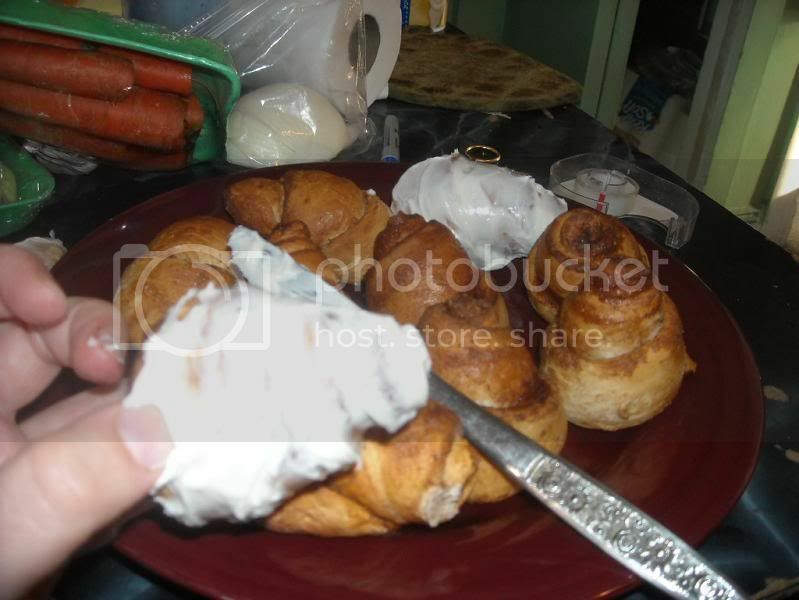 Okay, so now that we've covered the ingredients, we'll get onto how to create the cheapest cinnamon buns of all time. Still with me? Good. I like using wax paper for my work surface, it makes cleanup SO much easier. Plus, it gives you a place to spread out your dough. You'll need two biscuits for each bun. The bargain brand biscuits are skimpy so it takes at least two of them to make a decent-sized bun. You can use three to make them even bigger but it will yield less buns. If that's fine for you, like if you have less people to feed, by all means go for it. After mixing the cinnamon and sugar, all you do is roll the dough out and spread the mixture evenly over it, then roll it up, like this. 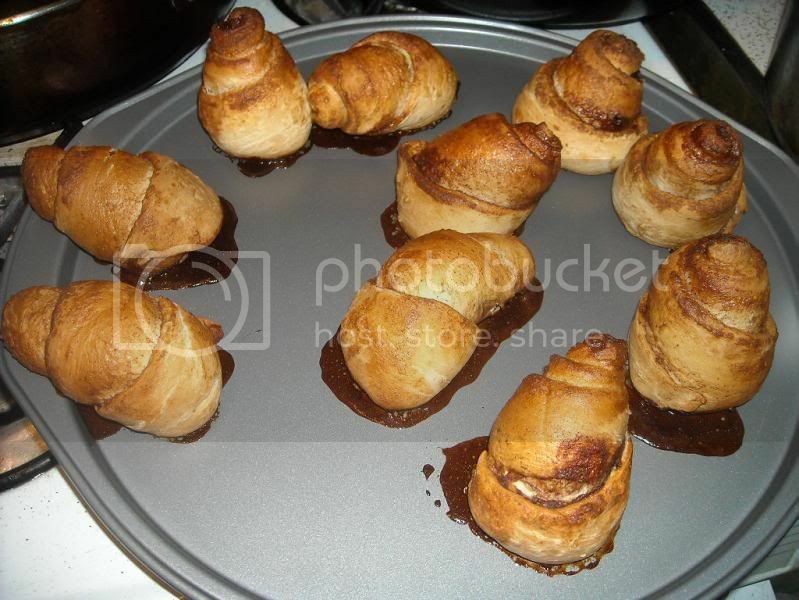 You can roll it up to look like a traditional cinnamon bun, or much like a croissant. Whatever you feel like. It may take you a few tries to get it tight enough or in the shape you want. Don't be afraid to unroll it and start over. You can even sprinkle whatever mixture you have leftover on top of the rolls. It's so good! 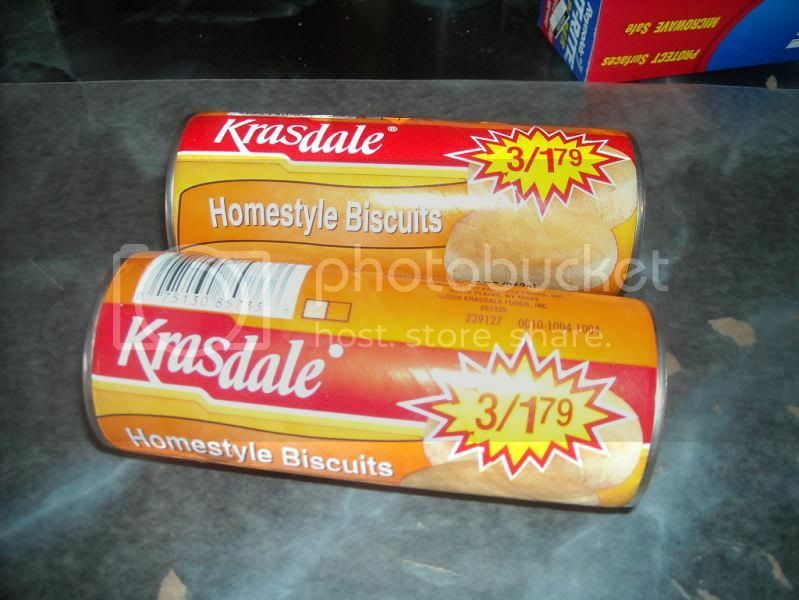 You put them on a greased baking dish in the oven that's been preheated to whatever temperature the tube says the biscuits are supposed to bake at. Then let them cook until golden brown. This part is kind of important... you should ice the buns while they're still warm. This way it melts the icing and you get that appetizing drip effect. See, I didn't do that because I was busy making other stuff simultaneously so by the time I got back to the buns, they had cooled off. Fail. 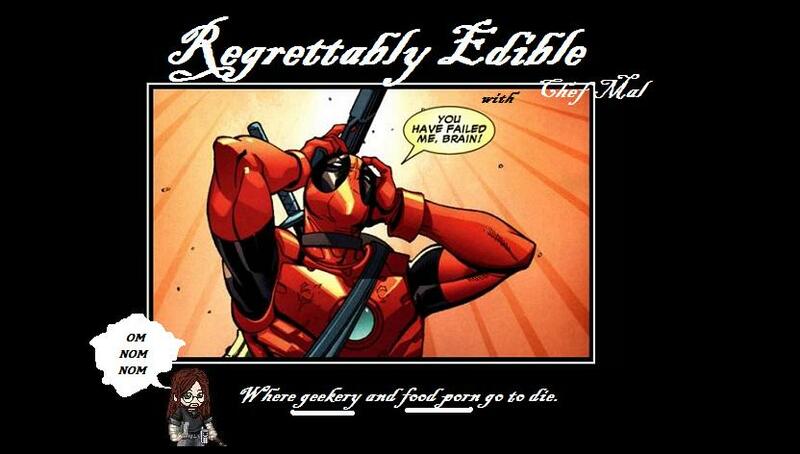 At least they tasted good. Whatever. Here's the recipe for ease of reference. Preheat the oven to 400 F or whatever the tubes say to bake the biscuits at. Lay down a sheet of wax paper over your work surface, or you'll have a lot of cleanup afterwards. Trust me on this. In a separate bowl, mix the brown sugar and cinnamon; make sure it's blended well. Take two biscuits and roll them out into a long, thin strip. 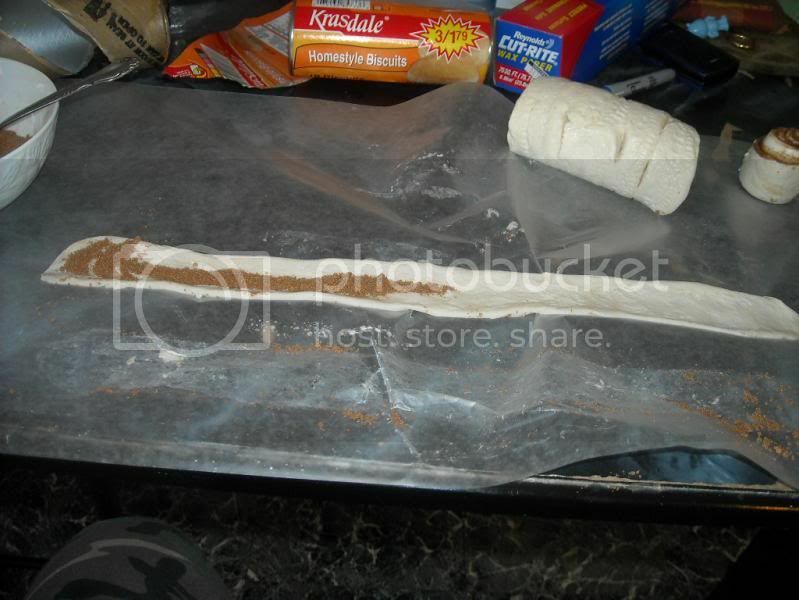 Lay the strip down onto the wax paper and flatten it. 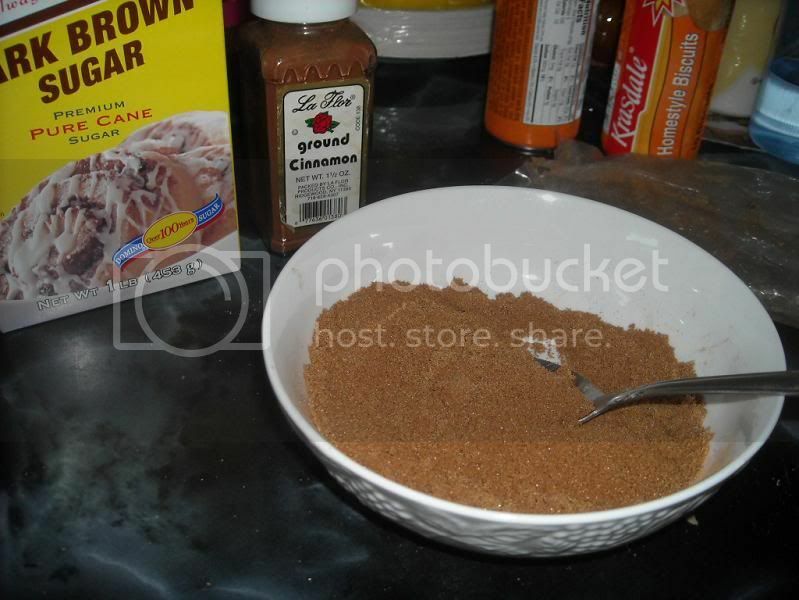 Use a spoon to fill the strip with the cinnamon-sugar mix, spreading it evenly. Carefully roll the strip up into a bun-like thing. 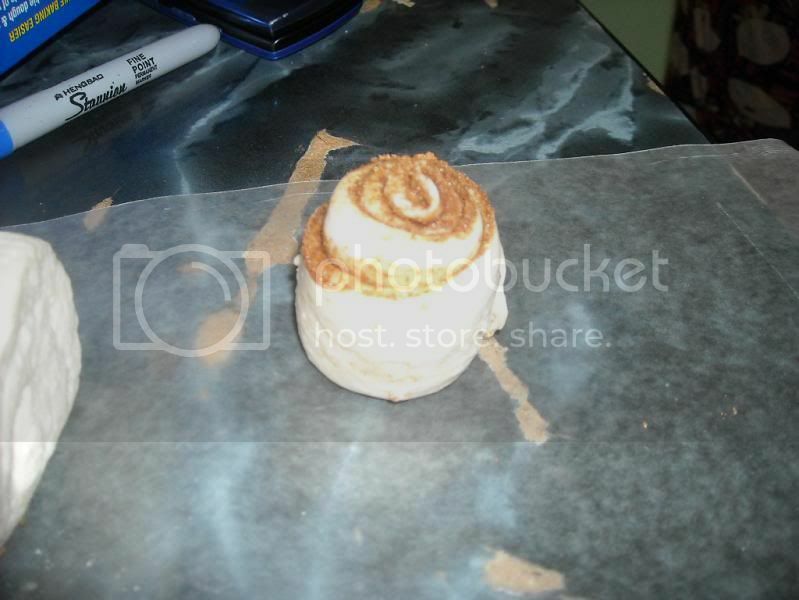 When you have them all rolled, use whatever cinnamon-sugar mix you have leftover to sprinkle over the top of the buns. Arrange them in a greased baking dish and bake until golden-brown. They may come apart, even if you think you pinched them closed really tight. It happens to the best of us. While they're still warm, spread the icing over them generously. Eat, drink lots of milk with them and enjoy.